Eugene Fodor (Eugene Nicholas Fodor, Jr.) was an American violinist born on March 5, 1950 (Perlman was about 5 years old.) His career was somewhat uneven and enigmatic. 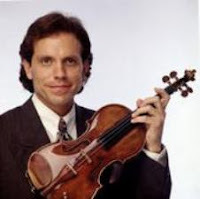 He first took up the violin when he was five and initially studied with Harold Wippler, concertmaster of the Denver Symphony for a number of years. At 10, he made his orchestral debut with that orchestra (playing Bruch's first concerto) and continued his studies with Wippler for another five years. At 15, he enrolled at Juilliard (New York) where he studied with Ivan Galamian. He also soloed with the Detroit Symphony at age 15. Josef Gingold was his teacher at Indiana University a short time later. By this time, he was already concertizing. He was then a student of Jascha Heifetz at USC. It has been reported that Heifetz dismissed Fodor from his class after Fodor refused to get a haircut to Heifetz' specifications (short.) He was also winning several competitions along the way, including the Merriweather Post Competition in Washington D.C. After picking up first prize in the Paganini Competition in Italy in 1972 at age 22, Fodor became famous. As if this weren’t enough, two years later (1974), he won a Silver Medal at the Tchaikovsky Competition in Moscow (no Gold Medal was awarded that year.) Ironically, even with these competition wins and dozens of successful concert tours under his belt, he was never a guest soloist with some of the best American orchestras – Boston, Chicago, and New York, among others. Speculation that Isaac Stern was somehow instrumental in shutting him off from certain venues prevails until this day. Fodor had at least 40 concertos and more than 40 violin Sonatas in his repertoire, in addition to countless miscellaneous works for violin and piano or unaccompanied violin. YouTube has a few videos of his playing. He also recorded several major works for the RCA, Sony, and Grazioso labels, among others. Fodor married (Susan Davis, with whom he had three children) in 1978 and divorced in 1985 (some sources say 1986.) He married her again in November of 2010. He was said to have a difficult personality. Fodor is known for having been selected to play Paganini’s violin (the Guarnerius Cannone of 1743, worth about $40 million) in a San Francisco recital in 1999, on the eve of Paganini’s birthday. (Other violinists who have been granted this honor are Camillo Sivori, Bronislaw Huberman, Salvatore Accardo, Ruggiero Ricci, Leonid Kogan, Dmitri Berlinsky, and Regina Carter) The recital received great as well as cool reviews. He is also known for having been arrested (in Massachussetts) for drug possession in 1989. His latest prize was the European Soloist award in 1999. Some time in 2010, he stopped playing the violin altogether. Fodor died on February 26, 2011, at age 60. His 1736 Guarnerius is now for sale in Europe - on the private market. This blog was first posted on August 29 of 2009. It was revised on March 1, 2011.